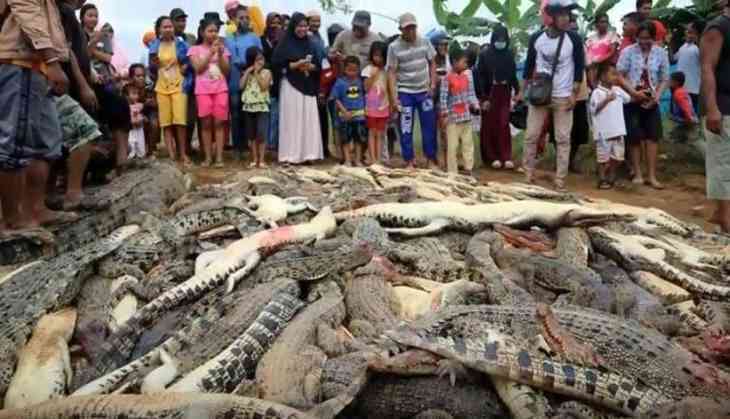 A local Thai man was killed by one of the reptiles and what angry mob did was shocking! On Saturday in Papua province, a man looking for grass for his livestock fell into an enclosure at a crocodile farm. He was terribly bitten and fatally struck by one of the crocodiles and succumbed to death. Following the funeral of the man identified as 48-year-old Sugito, angry mob slaughtered some 300 crocodiles. Local residents and the deceased family went to the local police station to launch a complaint against the farm's location. Even local conservation agency promised compensation. Head of the conservation agency said, "We made an agreement with the victim's family and conveyed our condolences." Not satisfied with the compensation, some hundreds of local mob headed to the crocodile farm armed with knives, machetes and shovels which they slaughtered some 292 reptiles of four-inch-long babies to two-metre adults, according to authorities. According to the police chief in Papua's Sorong district, "For now we are still questioning the witnesses."